As mentioned above, March was the first month of proper Pinterest campaign for Lingerose.com. This was the month of creating the strategy and many tests. I tried many different ways to gather followers and make Lingerose’s pins viral. Below, I present the stats of Pinterest activity in March. Because of a high competition, it was too early to prove that Pinterest’s campaign has an impact on SERP of Lingerose for the „lingerie wholesale” query. 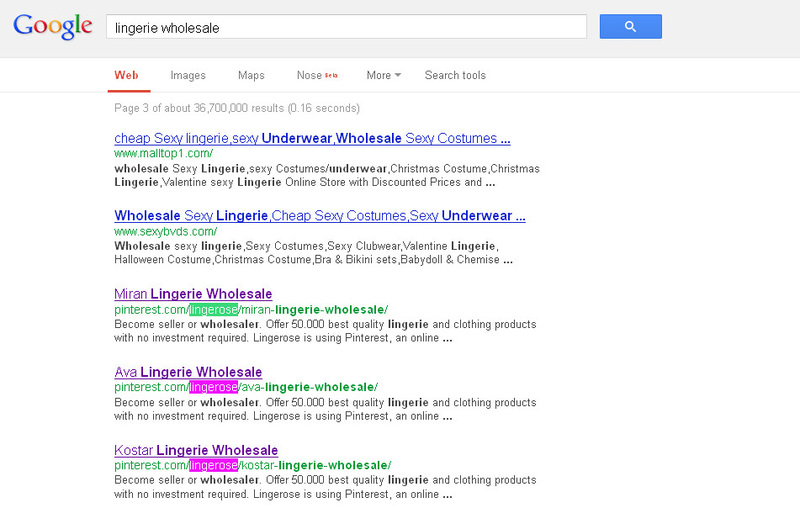 So, I started my research from more precise and related searched term – „lingerie wholesale Pinterest”. On the top of search results, I found 4 Pinterest’s boards and accounts. On the second position, Google indexed “Lingerie” board of “Pinsbook” user. This was a group board where I was a contributor, adding many of my pins. This board contained 9,191 followers and 6,837 pins. This pin was added about 16 hours earlier and received one like. I don’t think that this pin was particularly so important for Google. As you can see below there were at least 5 other of my pins around. Google had noticed a lot of keywords (“lingerie wholesale”) used in the one place and picked up the first pin to display in the meta description. 1. The keywords used in the boards or accounts’ names. All the 4 accounts used „lingerie” or „wholesale”. 2. The keywords used in the indexed accounts or boards’ descriptions. All of them contained descriptions included one or both of the keywords: „lingerie” or „wholesale”. 3. The keywords used in pins’ descriptions. The group board where I belonged to. 4. Strength of an account. Number of pins, boards and positive ratio of followers to following (more followers than following). 5. One web address of those 4 accounts was verified. Then, I typed in „lingerie wholesale” to see if there were any Pinterest’s results. 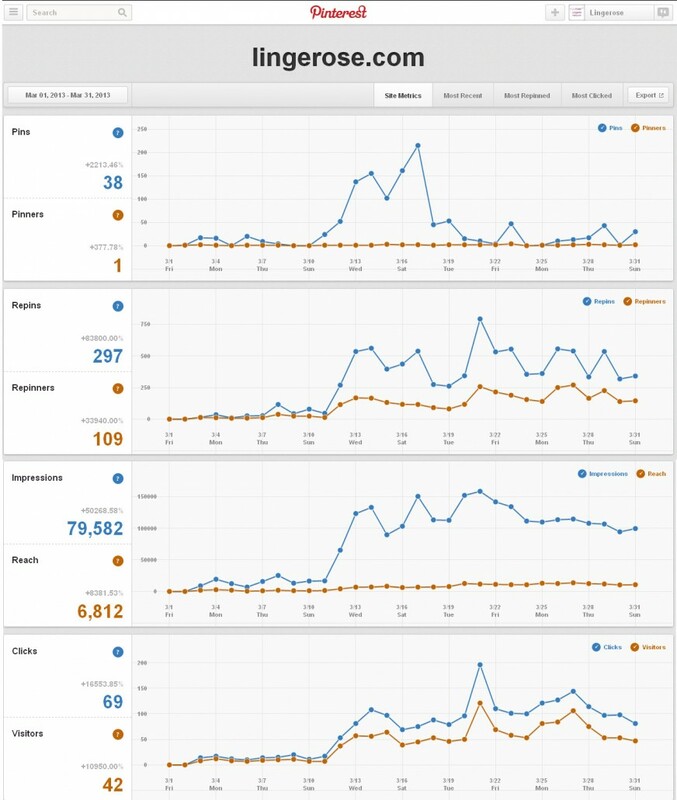 In the first 500 results there weren’t any yet, but the position of Lingerose.com increased a lot. After two weeks time it was classified at the 112th position. 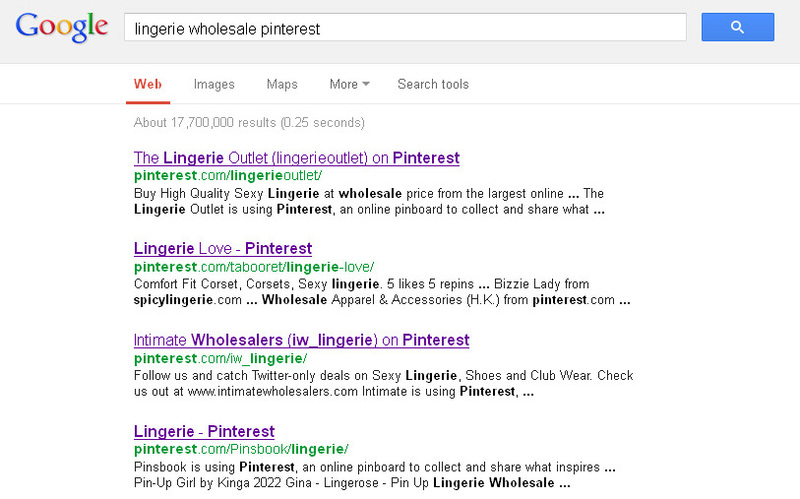 Three days later I started again checking Google results from the “Lingerie Wholesale Pinterest” query. That time, the group board where I added my pins dropped by 2 positions, but as previously – Google displayed the pin in the meta description. As I checked, during the last few days this board was the most active one from all the 4 Pinterest’s boards displayed on the very top of Google. I compared keywords density and the number of pins added, nevertheless – it dropped down. Google doesn’t like so many pins added with the same keywords and treats it as a kind of overstuffing. That’s why the board was lower than before. There must be some limit that we shouldn’t pass. What is the limit – it is difficult to say exactly, but it might be related to a number of pins or frequency they are added. After we pass this limit, Google stops to ”appreciate” our work and might even remove our board or account from its index. So, it is a kind of „rolling on the river”, so – be careful and do not over-pin! It is also worth reminding again that two other Pinterest’s accounts indexed in Google: “Intimate Wholesalers” (the 1st position) and “Lingerie Outlet” (the 3rd position) used the keywords in their account’s descriptions. And in the “Lingerie Love” board (the 2nd position) – the main role is played by a very strong account: “Wholesale Apparel & Accessories (H.K. )” with the keyword used in the account’s name itself. To see the results of the main query of my research – „lingerie wholesale” let’s move forward till the 20th of March 2013. I noticed that Lingerose.com jumped onto the 86th position, so I see that my activities bring the desired results. As usually, in March I started from the broader search query „lingerie wholesale Pinterest” and surprisingly, I found our board – „Miran Lingerie Wholesale” indexed on the second position of Google search results. What was interesting, in my personal opinion – this was the least attractive of the boards in Lingerose’s account – but it seems that Google doesn’t care about my sense of taste. What was more important from the SEO point of view: this board name included the query „lingerie wholesale” but on the other hand it was the newest one, with the lowest number of pins added amongst all the Lingerose’s Pinterest boards. Checking my most important search term – “Lingerie Wholesale”, I found the same board – “Miran Lingerie Wholesale” indexed at the position number 28. As you can see at the print screen which presents the top 12 search results in Pinterest – there were 4 pins from Miran’s board. So, in general, I can say that this was the most popular brand among all the other Lingerose’s brands which pins were displayed on the very top of search results for the “Lingerie Wholesale” query in Pinterest. Of course, this might be just a coincidence. If it is not, this could mean that there is some correlation between Pinterest search results and Google search results – they might use similar factors in their algorithms. Anyway, I leave this question unanswered. What was the last day of the first month of my proper Pinterest’s campaign? As Lingerose’s Pinterest boards and Lingerose.com itself were getting higher in Google SERP, I decided to leave analysis of more precise query „Lingerie Wholesale Pinterest” and to be focused on „Lingerie Wholesale” only. So, Google indexed all the 8 boards which included the searched keywords in their titles. Before I go further, just a quick reminder – 3 days before Google had indexed Miran’s board at the highest position from all of my boards, so I checked Pinterest’s search results and I found 4 Miran’s pins in the first 12 results at following positions: 1, 3, 7, 10. The first 3 boards (with the highest number of pins added) are exactly the same as the boards indexed at the positions from the 23th – to the 25th in Google’s search results. We can clearly see that the pins from those boards were displayed very high in Pinterest as well. Ok, so what are the factors that Google could have used to index these boards? First of all – the keywords used in the boards’ titles. Google displayed all of my 8 boards where I used the searched keywords in the titles. Then, Google needs to set how important for its search engine are those boards. Maybe it uses very similar factors as Pinterest does to display pins in its search results list. Or maybe, there is some correlation between Pinterest and Google search results that I mentioned before. Google could rate a board depending on positions of pins added to this board displayed in Pinterest search results. The higher pins’ positions are in Pinterest, the more important the board is in Google. However, this seems to be very complicated, because if it is true Googlebots would have to make search queries in Pinterest. Of course, there are some other – very important – factors as well. Why are my boards displayed, not the boards of other users? I definitely use a lot of keywords in pins’ descriptions. What is more important – Google considers my account as a strong one, not SPAMmy account, the account that doesn’t use any schedule pins tools, with all the pins added manually. The account that receives a lot of signals (my pins are very often repined and liked) with a great relation of followers to following.